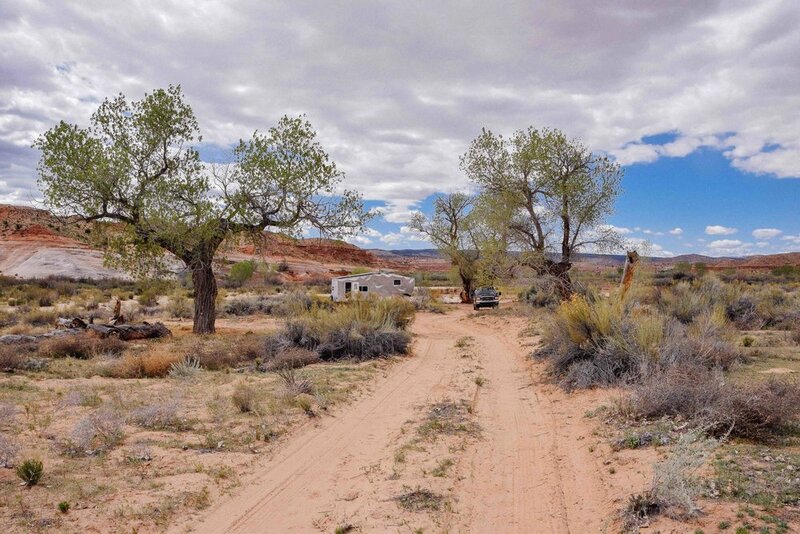 There’s living on the road, and then there’s living off the grid. Ching and Jerud, the awesome adventurers behind Live Small Ride Free, live in a 100 per cent solar-powered fifth-wheel, which allows them to live beyond the constraints that some of us rely on when RVing while still being able to use electricity for fun things like refrigerating stuff (beer, anyone?). Ching and Jerud completely rebuilt their fifth-wheel from a total fixer-upper into a head-turner of a vehicle that is wrapped in aluminum that either reflects or contrasts with the landscape depending on the angle. The interior is beautifully remodeled to be comfortable, attractive and energy-efficient. The couple calls their new home on wheels The Toaster, for fairly obvious aesthetic reasons (but the extra insulation that they installed means that you couldn’t really brown your bread in there – it doesn’t get hot enough!). With their two dogs, Tyki and Tybee, Ching and Jerud travel the United States, biking, hiking, canoeing and generally loving the heck out of the outdoors. ROVA caught up with them to find out a bit more about their life in The Toaster. Crystal Mountain Resort, Washington. We’re going to be spending the winter season working at the resort and snowboarding. Living on the road full-time has made me realize that home is a state of mind, a moment, and it happens to be on wheels for us. You guys live completely off-grid in your fifth-wheel, the Toaster. Why do you do that, and how? We believe that with our passion for the outdoors comes our responsibility to take care of it. So it was important to us to make the Toaster 100 per cent fossil fuel free – no propane appliances and no generator. We’re able to do this because our RV has 1220 watts of solar panels on the roof. For us, living on the road means immersing ourselves in the natural landscape. We wild camp with the Toaster as much as possible. You’re really passionate about the outdoors; what kind of adventure would we find you on, on your ideal fall day? Mountainbiking followed by some lake or river time with the dogs, and then relaxing by a campfire in the evening. Your pooches, Tybee and Tyki, look like they enjoy themselves on the road, too. What’s their favorite thing to do? Tyki loves going mountain biking with us and checking out the places we boondock. Tybee used to love all kinds of outdoor activities, but now, at 14 years old, she prefers hanging out with us in the woods taking in the scenery and meeting other travelers. You’re digital nomads, freelancing from the fifth-wheel. How do you balance work with adventure? Right now, pretty badly. It takes a lot of self-control to work on a beautiful day in a new area. Freelancing is new to both of us, and we still have a long way to a go for a good work/life balance. What items do you find are the most useful to have with you when full-timing? Toolbox: We never know when something on the truck or RV might break. It saves us a lot of hassle and money to fix things ourselves. Also because we rebuilt the Toaster, no RV shop will touch it if something breaks. 30-gallon water bag: This lets us take just the truck to get water to refill the Toaster. We’re able to boondock for almost a month at a time before we have to dump our gray tanks. Fridge: We have an apartment-size residential fridge, which lets us stock up on a lot of food so we don’t have to make long trips back into town to restock often. What is the very best thing that’s happened to you in your travels? We don’t have a specific ‘very best thing’ that’s happened. Rather, it’s our new lifestyle that we’ve made happen that’s the best thing. Having the freedom to travel wherever we want and at the pace we want is incredible. How about the very worst thing? While in the rainy Pacific Northwest we messed something up with our batteries, reducing how much electricity they could hold. With very little sun and no generator or propane appliances to fall back on, we spent a couple of stressful weeks being very stingy with electricity until we could figure out the problem and fix it. We also had to pay for campsites several times just so we could have enough power. What else can you tell us about yourselves? You can keep up with the lives of Ching, Jerud, Tyki and Tybee on their website, Instagram, or Facebook. Is this the Apple of the RV world?